Last year on this date, a Central African Republic presidential guard summarily executed a man in a hospital to satisfy a lynch mob pursuing him for murdering his wife. Amoudou Samassa was supposed to have stabbed his estranged wife to death, provoking an armed mob intent on dispensing street justice. After gendarmes pried him away unkilled, the incensed crowd jammed the streets of the capital Bangui. one guard officer, Lt. Jean-Claude Ngaikoisset, finally told the crowd: “If the death of this criminal is the only thing you’re asking for to clear these avenues, then I see no objection”. 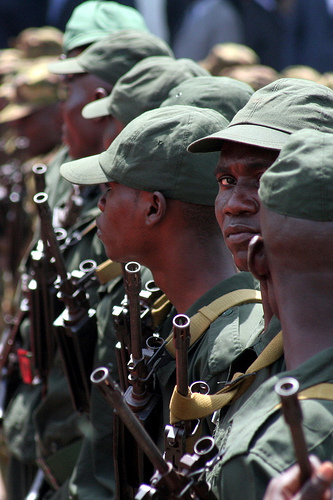 Central African Republic security forces.